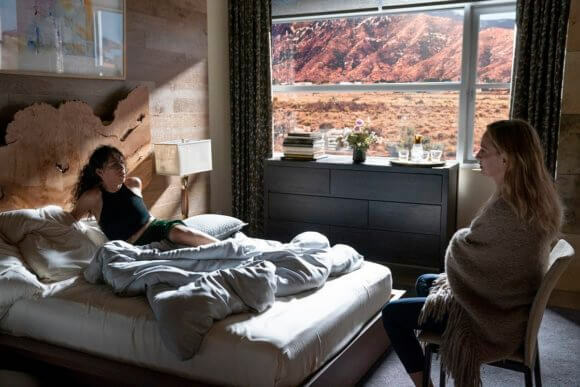 Netflix’s upcoming horror series Chambers has released the first batch of season one photos. The supernatural horror series’ first season will debut on April 26, 2019, with all 10 episodes available for your bingeing pleasure. Chambers was created by Leah Rachel who also serves as executive producer along with Alfonso Gomez Rejon. Winnie Kemp, Wolfgang Hammer, Jennifer Yale, and Steve Gaghan produced season one. “Taking place in a mystic, New Age pocket of Arizona, Chambers is a psychological horror story that explores the different ways we metabolize trauma. But what starts out as a grounded human story eventually pivots into something far more strange and f**ked up than you were expecting,” explained series creator Rachel. Oscar nominee Uma Thurman (Pulp Fiction), Screen Actors Guild nominee Tony Goldwyn (Nixon), and Sivan Alyra Rose (Running Shadow) lead a cast that includes Lilliya Reid (Vienna), Nicholas Galitzine (The Watcher In The Woods), Kyanna Simone Simpson (The Immortal Life of Henrietta Lacks), Lilli Kay (Paterno), Sarah Mezzanotte (Blue Bloods) and newcomer Griffin Powell-Arcand. 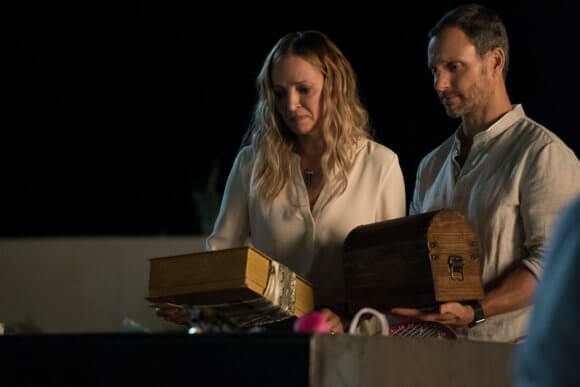 Uma Thurman plays NANCY, the mother of a heart donor who forges a hesitant relationship with the young recipient only to find out her daughter may not be as dead as she thought. Tony Goldwyn is BEN LEFEVRE: Becky’s Father. His warm charm and practical business acumen conceals a mystical bent that knows no bounds. He is also the philanthropic owner of Annex Power. Born in El Paso, Ben’s money is self-made, and he attributes a large portion of that to The Annex Foundation – a new age spiritual center. After the death of his daughter, Ben becomes even more devoted to their cause. Sivan Alyra Rose plays SASHA YAZZIE, a seventeen-year-old whose world is as big as what’s in front of her. But an untimely heart attack and subsequent complications from her donor set her life on a path riddled with sinister twists. What starts out as a mission to understand the mystery surrounding her heart donor’s death becomes a quest to understand her true identity and the darkness growing inside her. Lilliya Reid plays BECKY LEFEVRE a Suburban Prom Queen whose perfect veneer hides a much more complicated truth. After Becky dies in a tragic accident, her her heart saves Sasha’s life – before creating many complications. Nicholas Galitzine plays ELLIOTT LEFEVRE, a charming, nihilistic rich kid hell-bent on throwing it all away. Newly sober and still privately reeling from his twin sister Becky’s death, Elliot is determined to move on with his life and keep his past behind him. Until he meets Sasha. Kyanna Simone Simpson plays YVONNE, Sasha’s best friend. Growing up in the same low income housing development, Yvonne lives at home with two younger brothers, her father, and her terminally ill mother. Lilli Kay plays PENELOPE, Becky’s highly unusual childhood best friend. Although their friendship fell apart, Penelope has never fully let Becky go — her obsession growing even deeper after her death, and transferring onto Sasha. Sarah Mezzanotte plays MARNIE, a popular perfectionist who is happy to be the best at everything now that Becky’s gone. Marnie keeps a close eye on Sasha, but her motives are put into question when it’s revealed her parents are the head of a New Age organization with questionable ideals. Introducing Griffin Powell-Arcand who plays TJ, Sasha’s boyfriend. A track star who gets bussed in from the reservation, he’s the pride of Cottonwood High. He’s good inside and street-smart, but most importantly, he loves Sasha. TJ is her rock and when Sasha starts to worry that there’s something’s wrong with her new heart. TJ struggles to keep the closeness they once had while at the same school.